The senior managing underwriter or investment banker is the firm responsible for structuring and marketing the bond issue. The indivdiuals assigned to the financing typically specilize in tax-exempt and health care or educational financing. Secure the necessary approvals for financing. Assist the institution with the decision on whether to have a feasibility study and, if so, in selection of the financial feasibility firm and review of the report. Oversee the preparation of the Preliminary and Final Official Statements. Assist in the rating process and/or selection of credit enhancement. MHHEFA selects the senior manager on behalf of the borrower. The Authority makes its selection from the current list of Eligible Senior Underwriters. 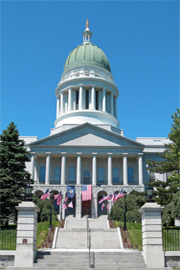 Periodically the Maine Health and Higher Educational Facilities Authority reviews its selection of Eligible Senior Underwriters. This list is subject to change. For more information on determining Eligible Senior Underwriters please contact Benson Caswell, the MHHEFA Program Officer at (207) 622-1958.